A new pamphlet released to coincide with World AIDS Day highlights why criminalisation is bad for women and girls, despite policymakers believing they are enacting new HIV-specific laws in order to protect them. In addition to criminalizing the transmission of HIV, these laws sometimes call for mandatory HIV testing of pregnant women, as well as for non-consensual partner disclosure by healthcare providers; further exacerbating the impact of such legislation on women. The call to apply criminal law to HIV exposure and transmission is often driven by a well-intentioned wish to protect women, and to respond to serious concerns about the ongoing rapid spread of HIV in many countries, coupled with the perceived failure of existing HIV prevention efforts. While these concerns are legitimate and must be urgently addressed, closer analysis reveals that criminalization does not prevent new HIV transmissions or reduce women’s vulnerabilities to HIV. In fact, criminalization harms women, rather than assists them, while negatively impacting on both public health needs and human rights protections. Applying criminal law to HIV exposure is likely to heighten the risk of or transmission does nothing to violence and abuse women face; address the epidemic of gender-strengthen prevailing gendered based violence or the deep economic, inequalities in healthcare and family social, and political inequalities that settings; further promote fear and are at the root of women’s and girls’ stigma; increase women’s risks and disproportionate vulnerability to HIV. Human rights responses to HIV are most effective. 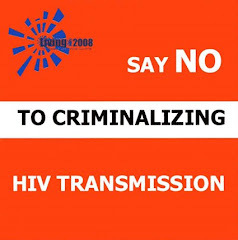 10 Reasons Why Criminalization of HIV Exposure or Transmission Harms Women was drafted by Dr. Johanna Kehler of the AIDS Legal Network, Michaela Clayton of the AIDS & Rights Alliance for Southern Africa, and Tyler Crone of the ATHENA Network. You can download the pdf of the pamphlet here. If you find this blog useful, please let me know, and if you find it really useful, please also consider making a small donation. This blog is now incorporated into new HIV Justice Network website which is intended to be a global information and advocacy hub for individuals and organisations working to end the inappropriate use of the criminal law to regulate and punish people living with HIV. There you will find the latest news and cases, searchable by date, country, and case type, plus all kinds of advocacy resources (including video). The information on the website is also classified by 25 topics, under six headings: Advocacy; Alternatives; Impact; Law Enforcement; Laws and Policies; and Science. Hopefully this will make it easier to find the information you need for your work, whether it be research into the impacts of HIV criminalisation; advocacy to prevent, reform, repeal or modernise existing HIV-specific criminal statutes or to limit the use of the law through prosecutorial and police guidance; or in promoting alternatives such as a supportive legal and policy environment via a human rights framework; restorative justice via a criminal justice framework; or Positive Health, Dignity and Prevention via a public health framework. The new HIV Justice Network website incorporates all the posts from my blog, Criminal HIV Transmission, which I began in 2007. Little did I know at the time that it would become an important global resource, filling a much-needed gap by capturing what is happening in real time. It was only when I attended AIDS 2008 in Mexico City, and discovered how many people knew of me and my work, that I realised how useful a resource it had become for advocates, researchers, lawyers and others from all over the world. Knowing that the blog served as an international information and advocacy hub placed enormous pressure on my time and personal resources. Until the beginning of 2012, the blog and its associated advocacy work received no funding – save the few wonderful individuals who donated via Paypal and a small grant from IPPF (thank you!). So I’m very grateful to The Monument Trust for its generous support which has allowed me to sustain, develop and expand the blog into the HIV Justice Network. I’d also like to thank Kieran McCann and Thomas Paterson from NAM, who designed and developed the site, as well as NAM’s Executive Director, Caspar Thompson, for his support and guidance. This international resource, HIV and the Criminal Law, which I wrote and edited for NAM, is available as an A5 book and at www.aidsmap.com/law. To order your copy visit www.aidsmap.com/law, or contact NAM at +44 (0)20 7840 0050, email: info@nam.org.uk If you are based in a low or lower middle income country, as defined by the World Bank, and would like a free copy of this book please contact NAM. Click on the image above to listen to Sean Strub, Catherine Hanssens, Vanessa Johnson and I discuss why HIV criminalisation in the US is a major issue for public health and human rights. The panel took place in February 2011 as part of the eQuality Thinking virtual convention. I delivered the keynote address, 'Combating HIV Criminalization at Home & Abroad', to the annual gathering of US-based HIV funders in Washington DC in December 2010. Video of my presentation is now available. Visit the FCAA website to watch it online. This meeting by and for advocates against the criminalisation of HIV nondisclosure, exposure and non-intentional transmission was held on July 18th 2010 prior to AIDS2010 in Vienna and co-organised by the Canadian HIV/AIDS Legal Network, the Global Network of People Living with HIV and NAM.